The Wally Parks NHRA Motorsports Museum provides an exciting educational experience for all visitors that step foot into the Museum. Through our exhibits, interactive displays, seminars and events, the museum is able to provide an understanding of the automobile, particularly motorsports, and how it has evolved in American culture. We offer unique guided tours and lesson plans for various age groups. The Wally parks NHRA Motorsports Museum is pleased to offer complimentary visits to all public schools. Tours are self-guided, and we encourage educators to engage students in active discussions about the uniquely American hot rods, racing vehicles and objects they see using strategies to develop students’ visual thinking. The Museum welcomes opportunities to work with you and your school to develop programs created with your curriculum and students’ developmental needs in mind. The Museum is currently working to develop robust educational programming in the arts and sciences, and we are looking for partners who would like to participate in that process. We invite the curious to contact us for more information. In everyday life we develop the habit of looking quickly, gaining the most basic information and then moving on. But it takes time to see a hand-built vehicle and understand how its form is dictated by its function. An extended engagement with an object can be both rewarding and fun. At the Wally Parks NHRA Motorsports Museum, we can tailor a Gallery Program for your class that will focus on a limited number of carefully selected objects rather than visiting every exhibition in the Museum. After a Gallery Program, we encourage teachers and chaperones to spend extra time with students in the galleries viewing other vehicles and other exhibitions not covered by the program. If you are interested in a program, please contact us before planning your visit. Self-Guided school visit programs are available Wednesday-Friday, from 10am – 4pm. Other days and times may be scheduled for special programs or events (Facilitated Programs are most often scheduled on Mondays and Tuesdays). What Age / Grade is the museum appropriate for? We recognize that every class has its own unique dynamics, so we ask that you make an informed decision regarding the appropriateness of the museum for your students. A visit to the NHRA Motorsports Museum is most comparable to that of an art museum. While we have a select number of hands-on experiences, we consider most of the museum content to be appropriate for Grade 5 and up. Up to 35 students per group. We suggest no less than one hour for an introductory program followed by a Self-Guided visit. Most visits are 90 minutes to 2 hours. The Museum requires one adult chaperone (non-student over age 18) per five students. Chaperones must remain with the group during the entire visit and accept responsibility for monitoring the group’s behavior. There is no charge for public school visits, however we do charge admission for adults who exceed the 1:5 ratio of chaperones to students. There is a discounted admission for private school and home-school visits, please contact us for information. Please call or email the museum no less than two weeks prior to a scheduled visit to sign up and confirm a date. Access to the museum may be restricted by special events and programs. Plan early for best availability as museum visits fill quickly. Please note that gallery programs should be reserved at least six weeks prior to the desired date. We make every effort to accommodate your first preference, but we cannot guarantee availability. If you must cancel, please email us as soon as possible at museumre@nhramuseum.org. Prompt notification may enable another group to schedule a visit. What do I need to know before the Museum visit? Previewing the Museum is recommended to help you prepare for your visit. 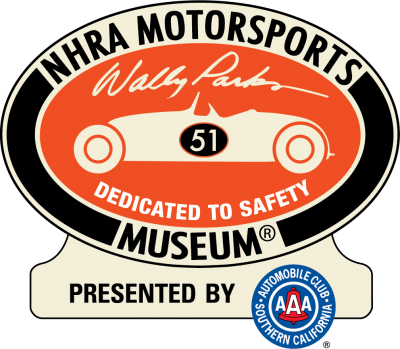 The Wally Parks NHRA Motorsports Museum is open Wednesday-Sunday 10:00 am – 5:00 pm, with extended hours during the Los Angeles County Fair and other special events. Bring a copy of your Visit Confirmation email for free admission for one visitor. One chaperone (non-student over age 18) per five students is required. Review guidelines for Mastering the Museum with your students. See below. Please review these guidelines with your students and chaperones prior to your visit. Experience the museum with your eyes and minds, not your hands. Please guide students through interactive exhibits for the most rewarding experience. Please avoid reaching across barriers or sitting/standing on exhibit platforms; accidents happen. Be curious! Ask lots of questions. Chaperones must remain with students at all times. Use only pencils for writing or sketching. Use clipboards for support, not pedestals or walls, and especially not the automobiles in the collection. If you wish for students to visit the Museum Store, please do so five at one time, on a rotating basis, and students must be with a chaperone. Please note the Museum has no indoor lunch facilities, however there are areas outside the Museum and the park across the street from the Museum is an excellent space for lunch. Buses may drop students off in front of the Museum at 1101 McKinley Ave. Please enter the parking lot via Fairplex Gate 1. The Museum is located East of the drive and the Child Development Center. The Museum requires one adult chaperone (non-student over age 18) to accompany every 5 students. Chaperones must remain with the group during the entire visit and accept responsibility for encouraging the group to explore the Museum, and for monitoring the group’s behavior (including use of restrooms). There is no food or drink allowed inside the Museum. If possible, please leave backpacks, lunches, and water bottles on the bus. The Museum does not have a coat check or storage facility for your group’s items. The Wally Parks NHRA Motorsports Museum is not responsible for items damaged, lost or stolen. Students have more meaningful field trips when they discuss their experiences before and after the visit. We suggest a 20 minute post-visit reflection activity, “I Went to the NHRA Motorsports Museum and…” to help you continue the conversation that started in the galleries. Tours are available year round Wednesday through Sunday from 10AM to 5PM. Groups of 10 or more are eligible for discount admission rates. Tours can range from 45 minutes to 1 hour and 30 minutes. Each tour includes a guided tour of current exhibits, an in depth look at our permanent collection, and the history behind the museum. We also offer a self-guided scavenger hunt. Tours can be custom tailored to the specific interests of your group, call (909) 622-2133 to book your visit today. Each year the Wally Parks NHRA Motorsports Museum partners with the Los Angeles County FairKids Discovery Club Field Trips to bring thousands of students to explore the Fair. The FairKids Field Trips program is a California State standards-based field trip. It is for preschool through 8th grade students, public, private and home schools, and admission is absolutely free of charge. The field trip gives FairKids three hours on the grounds without the public.